The analog we've been watching since April 9 is playing out nicely so far. 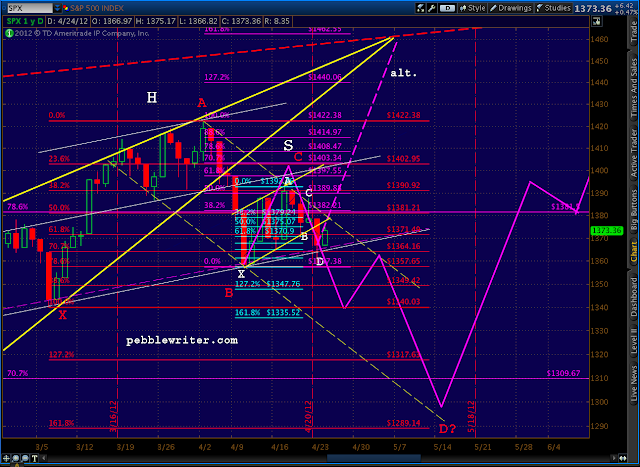 We got the original bounce at 1357 as forecast, followed by a rise to the middle of our 1380-1400 target range. The H&S pattern we expected did, in fact, set up and complete yesterday. Now, we're back testing the little channel (solid yellow) formed by the right shoulder. It was broken during yesterday's plunge. But, I think we're more likely to see the analog continue to work. The key will be a failure of this morning's rally/back test and a close below 1363. Note that we've also established a channel to the downside (red, dashed) that coincides nicely with the harmonic picture. The pale blue Bat/Crab indicates a potential to 1335-1340, which would be a nice spot for a back test of the H&S pattern itself. From there, the larger red Butterfly pattern takes over, with potential to 1317 (the 1.272) or 1289 (the 1.618.) Though, a drop below last October's 1292 would be a challenge. The key levels I'm monitoring today are 1378 -- at which point the back test starts to intrude into the previous channel, and 1382 -- at which point the larger red, dashed channel is jeopardized. This market is really getting to me today, at least you sound calm still. It is kinda lame that the best the bear can look for in the immediate term is 1340/50. Hell, won't take more than one major snap to get this nonsense making new highs >1422. AAPL had better miss and upset the market, or the bears ain't even going to get below 1350. PW, we didn't close below 1363 today. What's next to watch out for if the analog is to play out? The key levels are still the same as above -- 1382 for the bull case and a close below 1363 for the bear case. Who We Rooting For, Again?